Frontier Communications is one of the leading service providers in the United States. Last year, the company posted revenue of over $9.1 billion! It has a solid subscriber base of millions of subscribers. The provider has a coverage footprint in over 32 states across the country. One of the reasons for the provider’s success and popularity is Frontier home internet. The provider offers internet services aimed at a diverse target audience. It combines a high service standard with unbeatable prices to be the best at what it does. As far as internet services go, the provider is right there with the best of them. It offers a number of internet plans starting for as low as $20. These plans have a solid customer base. It has customers ranging from students to young adults to families to retirees. The provider offers fast speeds that are reliable with minimal downtime. Most importantly, the provider also offers protection from viruses and malicious attacks. It does so through its comprehensive security suite. Great Speeds at Great Price! Frontier home internet packages cater to all sorts of needs and incomes. Users can stream, surf, play games online, all without worrying about lagging speeds. What is more amazing is the fact that it doesn’t put a dent in the budget. Let’s take a closer look at these service offerings and what makes them popular. This reasonably priced option is the starter Frontier internet package. For as little as $20, you get a maximum download speed of around 6Mbps. This package aims to cover the basic internet needs of starter households. The provider offers a reliable and secure internet connection. This makes it easy for you to carry out all your internet activities. You can send emails, surf the web and connect on social media very easily with a 6Mbps connection. Photo sharing is simply a matter of a few clicks. The image files transfer in just a few seconds. This amped-up plan is a step above the starter Simply Broadband Core package. The plan’s current price is $25 per month and offers a great deal in return. The plan comes with download speeds going all the way up to a maximum of 12Mbps. The Simply Broadband Ultra plan aims to support more internet-intensive households. More than the Simply Broadband Core plan in any case. Other than emails, social media, and browsing, you can have heavier internet use as well. You can easily stream audio or video content using this connection. The high-speed connection also lets you connect to large e-commerce websites easily. This goes a long way to make shopping online a fun experience. You can download a standard 2.5-minute song for almost 20 seconds! For households that need to go a step above basic plans, this is the Frontier home internet plan of choice. For serious users, this is the top-of-the-line broadband service currently offered by the provider. The plan features a whopping maximum download speed of 18Mbps. It has enough bandwidth for you to easily stream and download movies. Use the internet without interruption. Experience fast video and audio content streaming for your internet activities. The provider claims you can download 10 standard-length songs or audio clips in 23.3 seconds! The Simply Broadband Plus plan starts for as low as $30 per month. FiOS stands for fiber-optic service. The provider offers fiber-optic internet in a variety of plans to meet varying home needs. FiOS is a 100% fiber-optic service that is affordable and offers some of the fastest speeds in the market. The provider’s FiOS 50/50 is a starter fiber plan for small households with speeds reaching up to 50Mbps. The plan currently costs you around $30 per month. It is best for households with 2-3 connected devices. Since its symmetrical, you get upload speeds as fast as the download speeds. Do more of the things you love on the internet with FiOS 50/50. The FiOS 100/100 internet plan is several steps above the provider’s base FiOS 50/50 fiber optic offering. It can cater to a larger household with more connected devices. 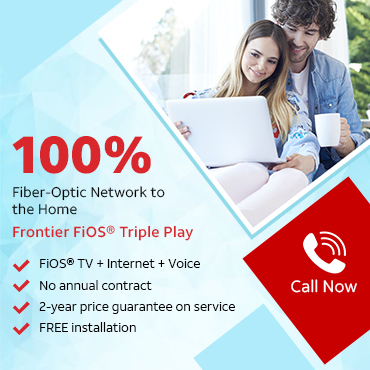 FiOS 100/100 costs you around $40 per month and works best with up to 4 to 7 simultaneously connected devices. It reaches blazing-fast upload and download speeds of up to 100Mbps. This is all thanks to its 100% fiber network. There is no better choice for households who are more demanding. Especially when it comes to reliable, disruption-free fiber internet. A few levels above the FiOS 100/100 plan, FiOS 300/300 is perfect for internet heavy households. It has upload and download speeds that are much faster than the other FiOS plans. You can get speeds reaching up to 300Mbps! That’s a lot of speed for any household. 8 or more devices can use the internet for intensive activities simultaneously. There’s enough bandwidth to ensure everyone can use the internet smoothly. More importantly, they can use the internet without disruptions. The FiOS 300/300 plan is one of the provider’s top-tier fiber-optic internet pans. You can order one for yourself, which will cost you $100 per month. This premium plan offers blistering speeds reaching all the way up to 500Mbps. This makes it the fastest fiber-optic plan that the provider has to offer. The premium plan costs around $150 per month. It is best for households who have eight or more connected devices. The plan has the most bandwidth. It lets all the users in your house access the internet without any hitches. A fiber-optic connection works through a direct line to your house. You don’t have to share the network with anyone. That means the neighbors in your locality won’t be hogging the bandwidth during peak hours. The premium FiOS 500/500 has the highest price tag in the provider’s internet options, at $150 per month. Many subscribers bundle it with TV to get the best of Frontier TV channels as well as FiOS internet. The company has solid network reliability and customer support. This is what makes it the provider of choice across 32 states in the US. Next PostNext What Channel is Starz on FiOS ?